This unit is all one piece and will fit both of our Hockey Helmets (Extra Small or Small). It will also work with most other types of Hockey Helmets. It replaces the metal face cage and uses the same fasteners and fastener locations. This top of the line unit is a high-impact polycarbonate shield. It also features an anti-scratch coating and anti-fog film. Does not fog up – extra clear! Features strategic vent locations and has a high performance floating chin cup. A quality unit that helps them see so much better with all the protection you need. COMES COMPLETE WITH EVERYTHING YOU NEED! – QUICK ASSEMBLY! ONE SIZE - will fit our EXTRA SMALL and SMALL Hockey Helmets. 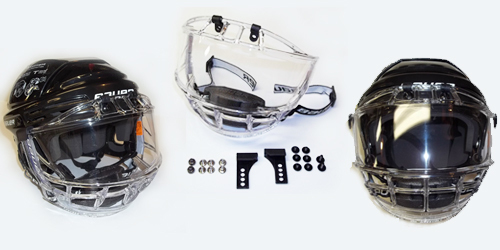 If you have another make or brand of Hockey Helmet this unit will fit both sizes - Extra Small and Small.